We are located in historic down town Mystic, Connecticut once the leading seaport of the area and now a well-known vacation destination. 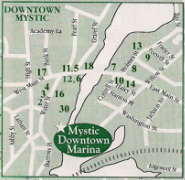 As our name suggests we are the closest marina to downtown Mystic. Our marina provides a quiet, relaxing atmosphere with a close proximity to all the restaurants, shops, and other tourist attractions. Click to book your transient slip now.